goTenna, makers of an innovative off-the-grid communication device that pairs wirelessly with smartphones, will be displaying the power of its technology at the 2015 Outdoor Retailer Winter Market and SIA Snow Show. 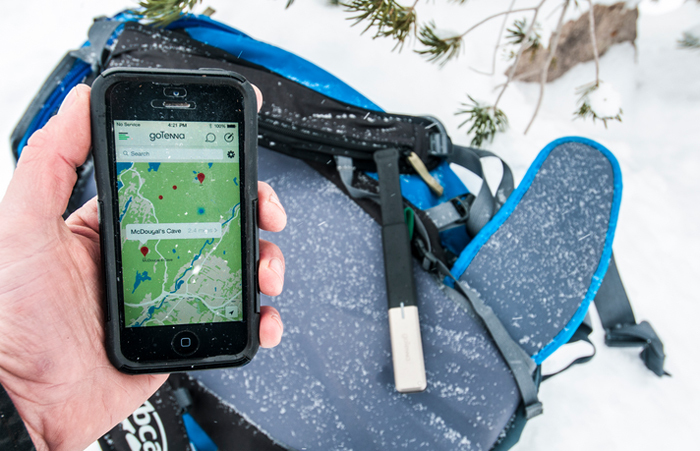 By ?allowing users to send and receive text messages and geo-location information with other goTenna users without cell, Wi-Fi or satellite service, goTenna’s groundbreaking system aims to change the way people connect in the backcountry. The small and lightweight device pairs wirelessly via Bluetooth-LE with smartphones and uses the goTenna app (available for iOS and Android) to allow users to create their own peer-to-peer networks which enable communication between two users, larger specific groups or even to broadcast social or emergency messages to anyone in the area. The automatic message retry and message delivery confirmation features eliminate any guesswork and goTenna’s detailed offline mapping features allow users to visually and contextually share their location or breadcrumb their way back to a specific point later – a feature especially useful when faced with coordinating among groups or in case of an emergency deep in the backcountry. Built with a waterproof, lightweight, dust-tight hardshell, this revolutionary device is made to withstand the severities of winter. Its rechargeable lithium-polymer battery provides approximately 30 hours of continuous use and its compact size easily fits in a pocket or backpack. At a price of $149.99 for two devices it is an affordable option that works perfectly with the same smartphones people already have. Once purchased there are no subscription fees or service charges. The price will increase to $199.99 in April. goTenna is available for sale exclusively on www.gotenna.com. See goTenna in action this winter at Outdoor Retailer Winter Market (booth 38159) and the SIA Snow Show (booth 1076).